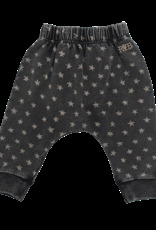 Black knit baby jogger pant in washed black with white stars all over. Ribbed cuffed legs. Elastic waist. Back pocket with logo. 95% cotton 5% elastane.